We offer both secure POP3 and IMAP connections to our email accounts. NOTE: If you are using Google Apps, click here for instructions on how to set up your email client instead. 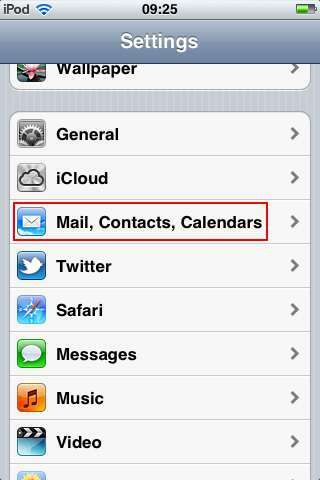 If you are prompted to Choose E-mail Service, select POP3 (or IMAP if you prefer that) and click Next. Email Address: Enter your full email address ( ). User Name: Enter your email username (including @yourwebsite.com). In the Outgoing server (SMTP) box, enter 465, and select TLS from the drop-down menu next to Use the following type of encrypted connection:. Click Test Account Settings… After receiving ‘Congratulations! All tests completed successfully’, click Close. Click Next, and then click Finish. YOU”RE DONE! Select Email Account, and click Next. Enter your name as you would like it to appear in the ‘From:’ field of outgoing messages, and click Next. Enter your full email address (). 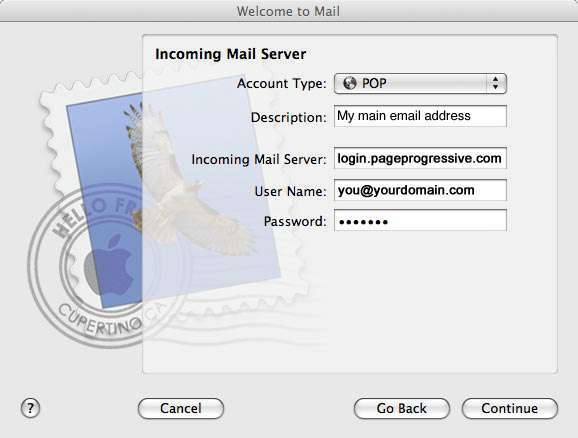 Incoming mail (POP3 or IMAP) server: login2.pageprogressive.com. Click Next, and enter your full email address (including ‘@yourdomain.com’) and your email password. Click Next, and then check the box next to Do not download my e-mail at this time. Click Finish. 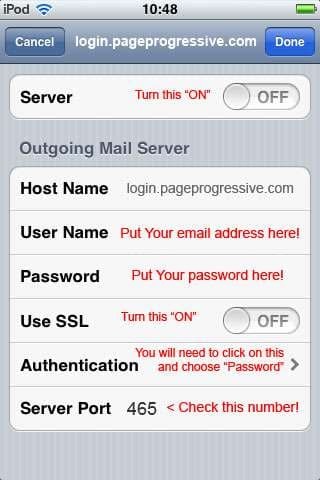 On the Internet Accounts screen, make sure that your login2.pageprogressive.com mail account is selected, and click the Properties button. On the Advanced tab, enter 465 in the in the box next to Outgoing mail (SMTP), and check the box next to This server requires an encrypted connection (SSL). Check the box next to This server requires an encrypted connection (SSL) under Incoming mail (POP3). The box next to Incoming mail (POP3) should automatically update to 995. Click OK. You’re done! 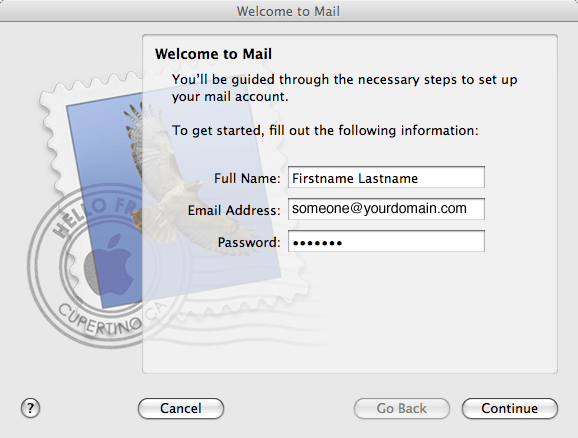 Close the Internet Accounts window and click Send/Receive to start checking your email messages. Click on “File” from the Mail menu in the top toolbar. Fill in your Firstname and Lastname. Enter your name and full email address. (If you see a mention of incoming port number, make sure that is set to 995, and it uses encryption). Make sure “Use Authentication” is checked. Enter your full email address under username and your password. Click on the “Account Information” tab. Click within the “Outgoing Mail Server (SMTP)” drop-down box. Phone systems change fairly rapidly, so the instructions and screens may vary a little but the screenshots below should give you a basic idea of what to do.